We think our Recurring Tasks feature allows nearly every single possibility you could imagine. Our team really tried to consider all cases and design the feature in a way that makes it still intuitive. You've got a lot of options, but if you stick with the basics, you'll cruise through it! Change Due Date (default): This type of recurring changes the Due Date to the recurring schedule you specify. For example, choosing every week, will change the Due Date to each future weekly occurrence. By default, this change happens as soon as your task is closed - but you can change which status triggers the recurrence. 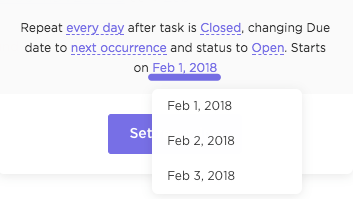 Also by default, when the recurrence happens, your task will be changed back to open but again, you can specify any status you want. Create New Task: This means we'll copy your recurring task and create a completely new task, on each occurrence. For example, select every week and we'll create a new task every week, on the day(s) you specify. By default, a new task is always created, regardless of the status. But of course, you can change this so that a new task is only created if the previous one is completed. Also by default, we'll copy the very first task you set recurrence on. But, you can change this to copy the most recently created recurring task. Change Due Date (default): Here you can specify to change the Due Date to any time in the future. For example, you can reset a task's Due Date to 7 days after you complete it, each time. Create New Task: With this, each time your task is Closed, a brand new one will be created. By default, we'll copy the very first task you set recurrence on. But, you can change this to copy the most recently created recurring task. Due Date: Optionally select an amount of time to wait after each interval before the next one starts. - Checked (default): The Due Date will be moved to the next interval in the future, regardless if any previous recurrences were missed. - Unchecked: If you miss an occurrence, the Due Date will be set to that earliest missed occurrence. This option should be used when you can't ever miss a day. Copy everything (default) or select which items you want to copy into the new task. Due date: Optionally, you can also set a Due Date on each occurrence. You can set it to the moment it occurs, or any time in the future. - The first task (default): Each time a recurrence happens, copy the very first task that recurring was started on. - Newest task: Copy from the most recently recurred task. - Checked: A new task will not be created until the current task is Closed. - Unchecked (default): New tasks will be created no matter the status of the previously created task. - Checked (default): The task will restart immediately, and the due date is mapped out for the next recurrence. - Unchecked: When a task is completed, it will remain completed until the recurrence date is reached. - Checked (default): The task will be created on the recurring schedule but will skip any missed occurrences. - Unchecked: If you miss an occurrence, the task will be still be created for that occurrence. - Everthing from the first task (default): Each time a recurrence happens, copy the very first task that recurring was started on. - Everything from the newest task: Copy from the most recently recurred task. Choose to start the recurrences on the next interval (default) or a later date. This option is available in the dynamic, recurrence summary at the bottom of the recurring task options. Tasks and subtasks each have their own separate recurrence settings. When setting a recurring task, all task attributes (aside from status) will remain constant in the recurrences. For example, this means that if you change the due date for task recurrences, the time estimate attribute of the task would remain the same. If you'd like to learn more, check out our FAQ doc here!